When you live with someone who suffers from dementia, you find you spend a lot of your time looking for things. I’ve heard tell that as dementia worsens, patients will hide things they consider valuable for safekeeping, and then forget where they put Gram’s wedding rings or a stash of cash. Or they just put things in odd places, like a hairbrush in the fridge. Mom is not at either of those stages yet. But that doesn’t mean I don’t still spend a good part of every day searching for something. I look for bobby pins, make-up, her cell phone, sunglasses, a pencil sharpener. Today, it’s her Mahjong card. She had it last week, and now it has inexplicably disappeared. I expect I’ll have to buy her a new one, or maybe a few. I figure I’ll either have to buy some spares, or come up with a good way that it can’t get lost again. My mind goes back to high school when you had to get a hall pass if you went to the bathroom during class to prove you had been given permission. Some teachers just handed over the laminated pass the size of an index card. Others were more devious, and attached something large, cumbersome and embarrassing in the hopes it would prevent students from loitering. My US History teacher’s was tire rim that most had to lug with two hands. My English Lit teacher’s was a wooden paddle, not the kind you row with, but the kind you whack someone’s backside with. While potentially effective at keeping her from losing another Mahjong card, neither embarrassing Mom, nor giving her a hernia is my goal. What I have to do is learn how to stay one step ahead of her. I’ve mastered this with the cell phone and sunglasses. I got so tired of having the turn the Jeep around that I now just make sure that they are in her purse before we leave the house. And if I had a dollar for every time I’ve heard her say, “I never put my sunglasses on the dresser!”, which is where I always find them, we’d have at least twenty extra bucks every month. You can’t take things for granted when you live with and care for a dementia patient. But you also can’t kick yourself for realizing you have to stay one step ahead of them after something has gone missing or she forgets to take the pills you put in front of her with a glass of water, or freaks out because she can’t find you when you told her you were taking the dog for a walk. It’s a learning curve almost every day because you don’t have a crystal ball. Take the pills, example. Every morning, I put her AM pills in a little glass and set them with water on the table where she drinks her coffee. Then I sit down to work at my desk with my coffee in full view of where she sits. Last week, I noticed around 4 PM that she had never taken her morning pills. Even though they were right there in front of her and she was six feet away from me. I assumed she would take them, and that was me not staying one step ahead. Now, I make sure. So, while I was hunting around for her Mahjong card today, I realized that we have a lot of drawers in her desk and dining set furniture that have the same stuff, i.e. junk, in them that has been in them since I was a kid. Stuff that has no earthly use anymore (transistor radios, blunt kindergarten scissors, my sister’s glasses from when she was 12), stuff that we never had use for (garage door opener when we never had a garage), enough candles to light St. Peter’s Basilica or just plain oddities (Burger King Rummy mini-playing cards). 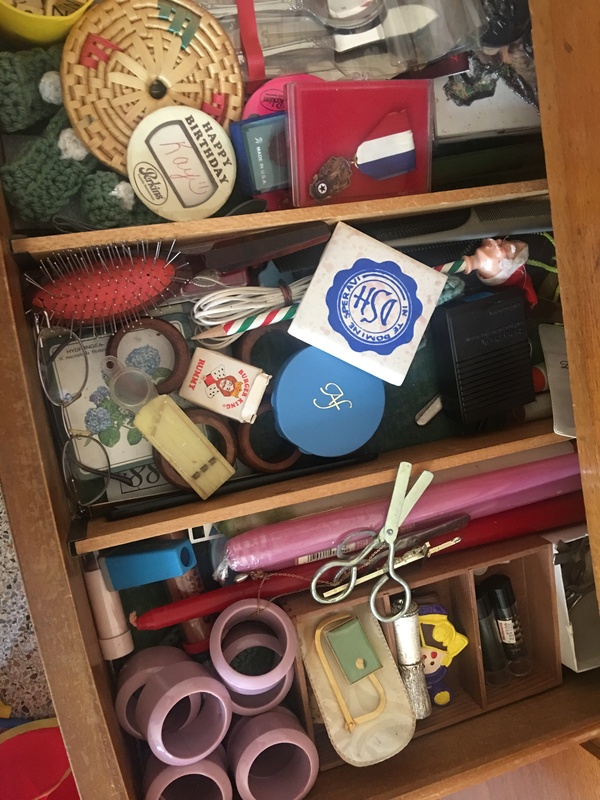 As nostalgic as it is for me to open these drawers like time capsules, I realized today that the more clutter and junk we have, the harder it is to find things when they go missing. I need to clean up and clear out the time capsules. Especially if she starts to hide things. The fewer clogged drawers and cubby holes the better when that time comes. And it will almost certainly come. There are three factors working on why Mom loses things that have to do with who she is and always has been, and are only exacerbated by the dementia: 1) She’s a neat freak, 2) She never throws anything away, and 3) She’s a stacker. Not all of these factors come into play when she loses things, but I suspect the missing Mahjong card is a result of all of them. The first two factors are, I think, pretty self-explanatory, so allow me to explain what I mean when I say she’s a stacker. Because she hates clutter and never tosses anything, old newspapers and magazines, books she has and has not read, junk mail, real mail, puzzle books, coloring books, receipts and, my hunch is, one Mahjong card, get “organized” into stacks. All over the house, towering but perfectly engineered stacks of stuff that may or may not be important. They pop up like weeds. Yes, every flat surface in her wake looks neat and tidy. But there’s nothing organized about it. And she has no recollection of what she stacked where, so hence, I go looking. It’s not so bad, and I have gotten used to it. And it really is part and parcel to taking care of a mother with memory loss. Staying one step ahead of her losing things is less about my convenience and more about not causing her stress. Losing things is stressful for her. It irritates her and reminds her that she’s not in her own home, where she knew where everything was. Which is not true, of course. She wasn’t any better at keeping track of things when she lived alone. But now when she loses things in my house, it’s because she’s not in her own element, her own space, her own home. And that causes her more stress. So, this week I’ll tackle the time capsules and, like every week before recycling day, I’ll sift through the stacks. Maybe the Mahjong card will turn up. Maybe it won’t. Francey is a blogger, caregiver and freelance copyeditor/proofreader. This is beautifully written. My heart hurts for you… my grandfather went through dementia, and it was a topic that no one really wanted to talk about in my family. Sending love to you and your family.